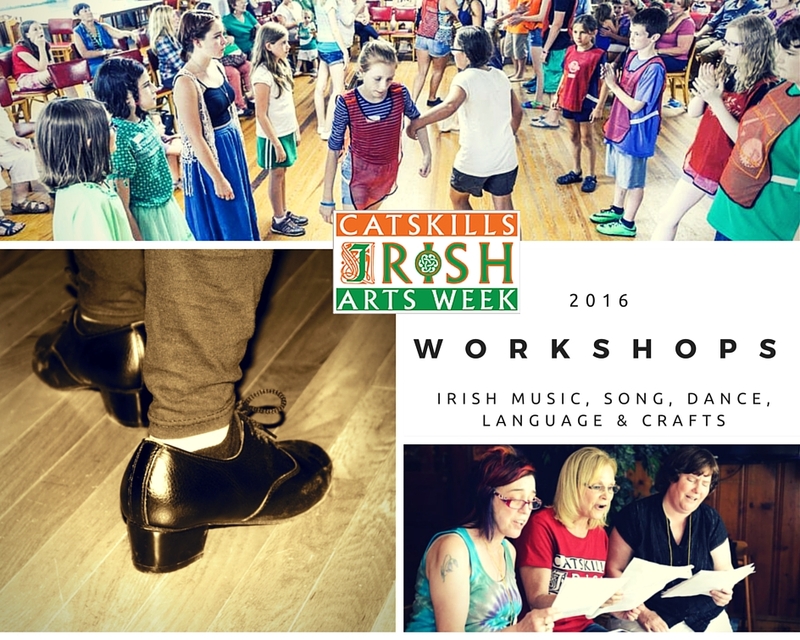 The Catskills Irish Arts Week has offered the highest quality instrumental, singing, traditional dance, and craft workshops for the whole family for 25 years. And this year, we are offering even more workshops that are new and exciting. We are adding arts and crafts and mime to our Tír na nÓg, Children’s Program. View the workshop instructors and music/dance workshop levels below to determine what you would like to take. For music and dance workshops attendees are required to be at a basic level. Beginner Level: You are new to the instrument and have always desired to learn more about Irish music. You must provide your own instrument. You have been playing traditional Irish music for two years or less, have little experience playing in sessions, are largely self-taught, and know a handful of tunes. You have been playing traditional Irish music for two to five years, attend sessions fairly regularly, and have taken lessons in the past. You have been playing traditional Irish music for more than five years, may have played semi-professionally. You might be a session leader in your own locality or have students of your own. You have been dancing for less than a year and have little or no experience of Set Dancing or Ceili Dancing. You have been dancing for one to three years and have some experience with Set Dancing. You are familiar with the types of dances, and can pick up new figures fairly quickly. You have been participating actively in traditional Irish set dancing for more than five years, may have done some calling or leading and are comfortable dancing a wide variety of sets. You can dance top or sides, learn quickly, and can instruct others in your set during a dance. Our singing workshops are friendly and relaxed, and open to all levels of singing ability. This year they will be hosted by Sean Nos Singer Mairin Ui Cheide from Connemara, and Traditional Irish Songs in English by Grace Tolan from Donegal. Wonderful arrays of classes in fine and craft arts – Irish Knitting, Art and Stone Wall building are taught by a team of talented artists, each with something distinctive to offer the Catskills Irish Arts Week experience. Please Note: Each of the classes has a slightly differing materials fee structure, depending on what is needed. The Tír na nÓg Youth Program will run Monday-Friday from 9:40 AM to 11.40 and 1.30 to 3:30 PM. The program is only $200 per student and is offered to students, ages 5-12 and 13-18, workshops in Music, Song, Dance, Poetry, Storytelling, Irish Mythology, Irish Language and Celtic Art. We’ll tailor the workshops to the children’s strengths throughout the week. It is a continuous program designed to immerse our children in a week of Irish Culture & folklore, prompting these precious seeds to bloom, grow and continue our Celtic Traditions. Children should bring with them a Boxed Lunch and Drinks. The children will then divide into age related classrooms, for a fun workshop experience. Friends and family members may stay together if they wish!